After years of planning and construction, residents have started moving into One Arlington, the luxury apartment tower formerly the Sheraton Hotel next to Arlington International Racecourse. The tower, which was granted partial occupancy on Oct. 2, is the first phase of the larger $250 million redevelopment known as Arlington Downs. When completed in a few years it will transform the former Sheraton site into a 27-acre “urban campus” with retail, residential and commercial. So far, about 40 of the 214 units at One Arlington have been leased, said Josh Wohlreich, vice president of development at Stoneleigh Comapnies, which is managing the residential portion of Arlington Downs. Residents have started moving into units on the first and second floors, as construction is ongoing on the upper levels. 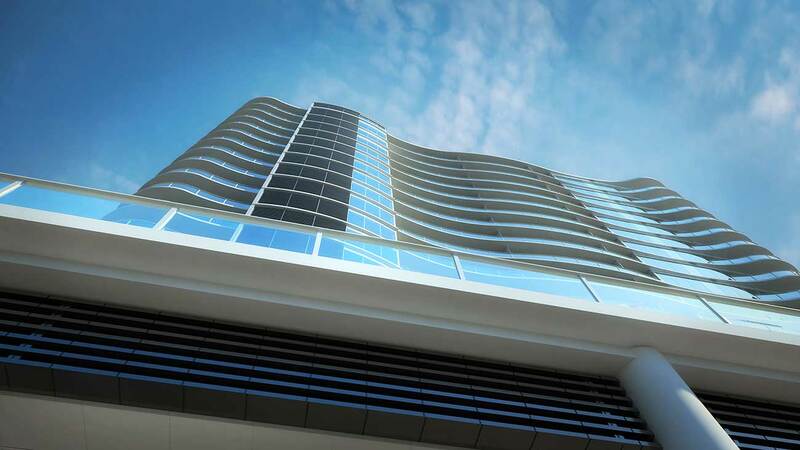 One Arlington is expected to be complete by the end of 2014, Wohlreich said. 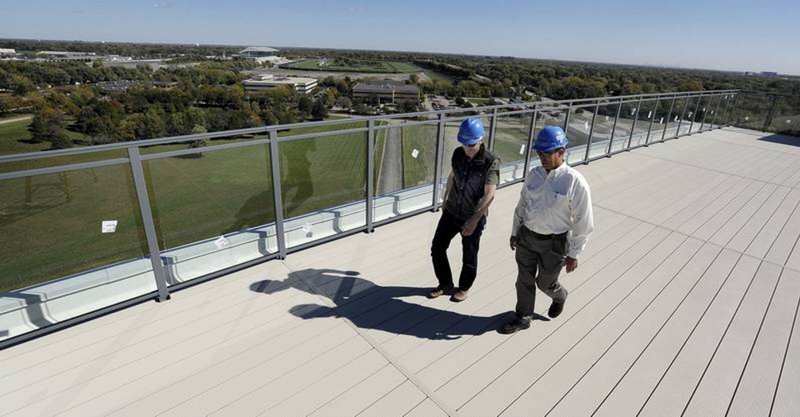 When finished, the tower will have an “amenity floor” without residences, with a demo kitchen, a viewing room, a yoga/Pilates room, an 1,800-square-foot fitness center and a 5,000-square-foot outdoor deck overlooking the track with grills, fire pits and telescopes, said David Trandel, CEO of Stonestreet Partners, developer on the Arlington Downs project. Almost every unit will have a balcony, while some of the penthouse-level apartments will have multiple balconies or a larger-sized terrace overlooking the area. Each unit will have a washer-dryer and every resident will be guaranteed parking in a garage or on the property. Developers said most leases will be for 12 months and pricing will be around $1,300-$1,500 a month for studios, $2,000 a month for one-bedroom apartments and $3,000 a month for two-bedroom apartments. Residents who have moved in are “thrilled with their units,” Wohlreich said. The original Arlington Downs plan called for several residential towers. Wohlreich said officials will start some predevelopment and architectural work on the next tower in 2015. The next phase of the project includes a new Four Points by Sheraton Hotel with 161 rooms and an expanded water park. Developers have a deal with Wilderness Resorts, which owns resorts and water parks at Wisconsin Dells, to renovate the original water park into one with an additional 10,000 square feet, two more rides and a redesign to gear the park more toward a teenage crowd, Trandel said. Meanwhile, developers said residents and the community will likely be amazed by the transformation of the old Sheraton Hotel, which closed in 2009, into the new One Arlington. One Arlington is planning a community open house for later this month to reintroduce the building to the community, he said. The developer behind One Uptown has unveiled new renderings of the rebranded 20-story, luxury residential and retail tower under construction of the northwest corner of McKinney and Routh streets. The new renderings show a curvy building, which the Illinois-based development firm Stoneleigh Cos. expects to be one of the most striking buildings in Uptown upon completion in mid-2016. Considering the tower’s location in Uptown, Stoneleigh Cos. wanted to rebrand the tower after the neighborhood, said CEO Rick Cavenaugh, who has been working on this project for more than a year. One Uptown will include 198 luxury apartments, 18,500 square feet of retail and restaurant space and a 475-car underground parking garage. The project plans also include two pools — Dallas’ highest private rooftop infinity pool and a second floor relaxation pool open to retail patrons, with a full-service bar overlooking the corner. The developer has already signed restaurant leases with Brazilian steakhouse Fogo de Chao Churrascaria and Style & Grace. Stoneleigh is working with Dallas-based architect Humphreys & Partners and general contractor Hunt Construction Group on the project. Other members of the project team include USA Infrastructure Investments LP and equity partner SunGate Capital Funding 2. BARRINGTON, IL – October 1, 2014 – Stoneleigh Companies announces re-branding of their 20-story mixed use luxury high rise currently under construction at the northwest corner of McKinney Avenue and Routh Street. When completed in mid-2016, One Uptown will be one of the most striking buildings in the Uptown neighborhood including 198 luxury apartments, 18,500 square feet of retail and restaurant space, and a 475-car underground parking garage. The project received its full building permit in September and began construction with excavation for the parking garage. Additional tower amenities will include two pools—Dallas’ highest private rooftop infinity pool and a second floor relaxation pool open to retail patrons featuring an outdoor club deck and full-service bar overlooking the bustling corner. “Considering the premier location of our project, we feel it’s appropriate to brand the iconic tower in accordance with our address in the heart of Uptown. We have seen what a remarkable and inclusive community Uptown is and we are proud to be a new neighbor. We want our identity to reflect that sentiment and commitment to the City of Dallas” says Rick Cavenaugh, CEO of Stoneleigh Companies. Stoneleigh also announced that Fogo de Chấo Churrascaria, the internationally renowned Brazilian steakhouse, has leased space in the One Uptown development, joining another premium restaurant, Style & Grace. “Our two premiere restaurants have recognized that this location is irreplaceable and their international designs will create a high level of energy and world class service in the heart of Uptown” reflected Cavenaugh. Stoneleigh Companies, based in Barrington IL is teaming with USA Infrastructure Investments LP to develop One Uptown. The project team includes Humphreys & Partners as the architect and Hunt Construction Group as the general contractor. Bank of America is the construction lender for One Uptown and SunGate Capital Funding 2 is the institutional equity partner. Stoneleigh Companies is a multi-family investor and developer and operates 4,300 units and is under construction on five new multi-family communities in Denver, Keller, Houston, Chicago and Dallas. One Uptown will be the flagship of the One brand of urban, transportation based developments being built by Stoneleigh to complement its Waterford Residential brand of garden apartments. For more information, visit www.waterfordresidential.com.